Sisters prepare for rush week all year, and it’s one of the largest determinants of a chapter’s success. That doesn’t necessarily mean you need to get more potential new members to commit to your chapter versus other chapters on campus, but it does mean gaining a strong, quality rush class based on your chapter’s individual goals for growth. So how do you judge rush results, exactly? How do you tell a good rush week from a bad one? The answer will be different for each chapter, honestly. It’s up to your recruitment officers, along with advisors and other Greek Life officials to help determine what works best. A new colony may be seeking a totally different recruitment goal than an established sorority chapter committed to a certain goal and upward trend in recruitment. Yet one thing is the same for every sorority chapter across the country: New sisters are your vital lifeblood, and the only way for sororities to keep a finger on the pulse of the ever-growing and evolving Greek world is to recruit. If you’re concerned about coming up short during rush week, Pennington & Company wants to help you breathe new life into your recruitment. Let’s jump right in and talk about How to Get Better Rush Results. If nothing else, you want to show potential new members during sorority rush that your chapter is full of heart. What better physical representation of that than your sorority chapter house? Holding recruitment events on campus is always ideal at a bare minimum, but it’s much better for sorority chapters to hold their rush events at their house, if possible. Bringing potential new members in your house will immediately give them the sense of the camaraderie sisters have fostered living together. It’s the same as any family. A home is not just a house, but a place where love grows. The trick is in the presentation, in using your house to show potential sisters the human connections and opportunities to grow together that your chapter offers. Make sure your house is up to code and that unsightly damage is repaired prior to holding rush events. Clean thoroughly, including the outside lawn and landscaping. You want to put your best foot forward. If your house is out of date, or no longer fits the style and needs of the chapter, you may want to consider fundraising for a house renovation. Keep renovations in the traditional style of the house, going for the big upgrades that are most likely to attract new recruits and improve house living, but without going overboard and being gaudy. This applies to sorority rush events in general, not just for renovation projects. It’s better for you to minimize over-the-top costumes, jewelry, decorations and so forth during rush events, and to focus on building human connections with young women based on shared values. Get to know each potential new member by bringing her to the chapter house and asking the most important question: Is this going to be her home? Alumnae have been through plenty of sorority rush weeks. They’ve seen the good and the bad. They’ve seen the sisters who go on to become sorority president, and they’ve seen the chapter washouts. Very few things that happen during recruitment will come as a surprise to your seasoned alumnae. While alumnae usually can’t participate directly in rush events and shouldn’t come into contact with potential new members to influence their decisions, they can give your chapter a tremendous boost during sorority rush by helping out behind the scenes. The first step is to make sure you’re effectively engaging your alumnae. It is crucial that you build a strong sorority newsletter tailored to alumnae interests, and keep them up to date if you are seeking their participation in events or activities such as rush. This is especially true of local alumnae, who may be more available to help guide sisters in building a successful rush. However, even alumnae at a distance might still be able to help. With the use of sorority recruitment software such as Select-a-Sis and Bidlily, alumnae can see the recruitment voting process in real time as sisters use their mobile devices to score potential new members. Alumnae can help with the scoring process and reporting to Panhellenic more efficiently using this type of software. Ultimately, any level of alumnae involvement in sorority rush is a win. It’s probably something most sisters haven’t really thought about much, but when you hold your sorority rush makes a massive impact on how successful your recruitment will be. It may seem counterintuitive at first. If your chapter offers a quality sorority experience, why should it matter when you approach potential new members about joining your sisterhood? Once you see the data, however, you will quickly realize that fall is almost always the optimal time to hold sorority rush. According to the National Panhellenic Council, fall rush allows sororities better retention of first-year students who can better adapt to college and sorority life, with stronger academics through early engagement with mentorship an scholarship, as well as many other benefits, even including nicer weather than other times of year. For some college Greek systems and sororities, rush is partly governed by a quota-total system. With continuous open bidding, smaller chapters who are less capable of recruiting on the level of larger, more established chapters during the primary rush period can meet goals through this system. However, you don’t want to rely on this type of recruitment if it can be helped. By using the methods mentioned above, your sorority chapter should be able to achieve a robust, successful rush. 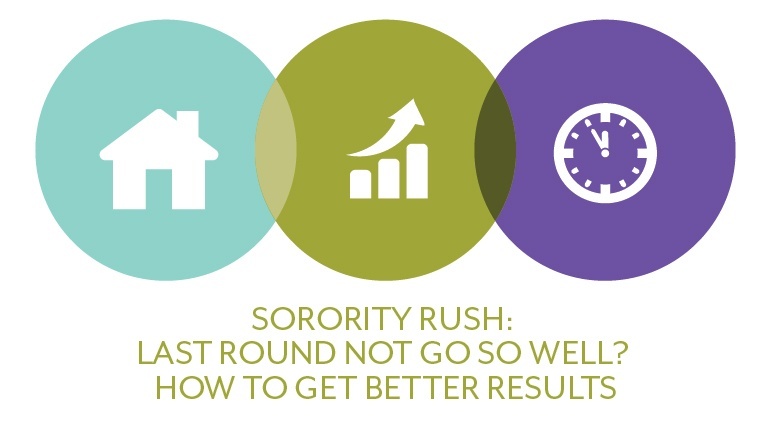 These are just a few ways to Improve Sorority Rush Results. What methods does your chapter use? Do some work better than others? Tell us about it in the comments below.